Laos has become popular with tourists for its relaxed style of living and for retaining elements of the “original Asia” lost elsewhere. 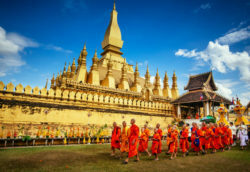 The main attractions for tourists include Buddhist culture and colonial architecture in Luang Prabang; gastronomy and ancient temples in the capital of Vientiane; backpacking in Muang Ngoi Neua and Vang Vieng; ancient and modern culture and history in The Plain of Jars region (main article: Phonsavan); Laos Civil War history in Sam Neua; Trekking and visiting hi ll tribes in a number of areas including Phongsaly and Luang Namtha; spotting tigers and other wildlife in Nam Et-Phou Louey; caves and waterfalls near Thakhek; relaxation, the Irrawaddy dolphin and Khone Phapheng Falls at Si Phan Don or, as they are known in English, the Four Thousand Islands; Wat Phu, an ancient Khmer temple complex; and the Bolaven Plateau for waterfalls and coffee. Call 9303283032 and speak to our Travel Consultant to help you plan your holiday.